Eat your fruits and veggies. It’s the most stated fact of healthy living. Unfortunately, it’s falling on deaf ears. 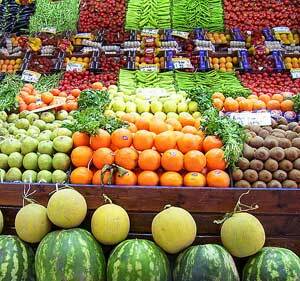 Fruits and vegetables are the backbone of a healthy diet. They are almost always low in fat and calories, and packed with vitamins, minerals, fiber, antioxidants, and so much more. And oh, there’s no cholesterol. But, according to the 2019 State Indicator Report on Fruits and Vegetables, only 14 percent of American adults are eating the recommended daily servings of fruits and vegetables. The government study says that even less (10 percent) of high school students are getting enough fruits and vegetables. The report is meant to shine a light on a campaign to get at least 75 percent of Americans to eat two or more daily servings of fruit, and for at least 50 percent to consume three or more daily servings of vegetables. “A diet high in fruits and vegetables is important for optimal child growth, maintaining a healthy weight, and prevention of chronic diseases such as diabetes, heart disease and some cancers, all of which currently contribute to health care costs in the United States,” says Dr. William H. Dietz, director of the CDC’s Division of Nutrition, Physical Activity and Obesity. No state in the Union even came close to the national objectives for adult consumption of fruits and vegetables. So, how can we start moving in the right direction? According to the government report, they would like to see grocery stores stock more “high-quality fruits and vegetables.” This suggestion is a little puzzling, since every grocery store I’ve been to has plenty of fruits and vegetables to choose from. The second suggestion is perfectly logical: increase the availability of healthy foods in school cafeterias and vending machines. Lastly, the report suggests that states create “food policy councils” that evaluate the access to fresh produce on a community and state level.